This development is aimed at partially unavoidable contaminations in any crushed material which are simply ‘blown away’. 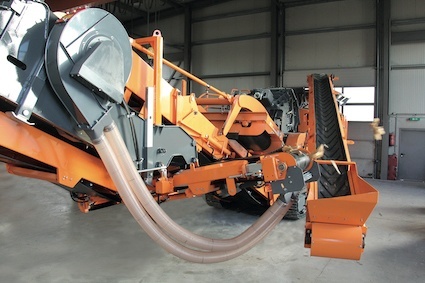 The centerpiece of the RVB1700 is a variably adjustable blower, which is connected by flexible hoses to the air nozzle, which is adjustable in inclination. Through the narrow slot of the air nozzle, the air emerges and blows diagonally from below through the crushed material, so that the unwanted lightweight materials (such as polystyrene, textiles, gypsum, foils, wood, etc.) is removed. The Rockster RVB1700 wind sifter is hydraulically operated and can be completely integrated into each Rockster crushing plant. The ‘wind sifter package’ is offered as an option by Rockster on all new machines. For existing plants, Rockster Recycler offers a retrofit kit which can be installed by the Rockster service team at the headquarters located in Ennsdorf, or on the customer’s site. If the customer has its own technical capabilities, then the retrofit may be undertaken ‘in house’.